and platelets or thrombocytes . The blood has three types of formed elements: erythrocytes (red blood cells), leukocytes (white blood cells), and platelets or thrombocytes. Blood cells and platelets. 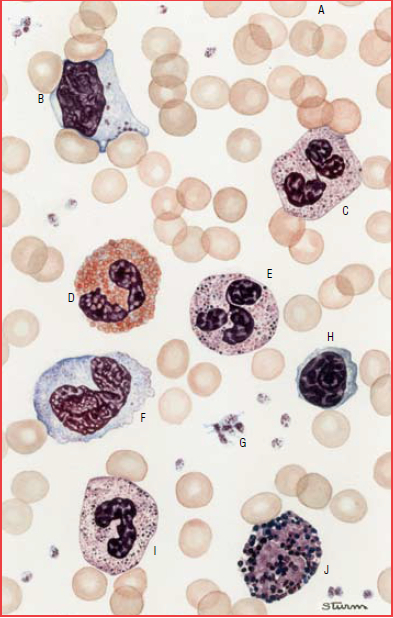 A = erythrocytes, B-F = leukocytes, G = platelets (thrombocytes), H-J = leukocytes. Erythrocytes: Also called red blood cells (RBCs), erythrocytes are the body’s most numerous blood cells. (4.60 million/ μL) for women and 5.20 x 106/μL (5.20 million/μL) for men. release carbon dioxide and take up oxygen again. antibody; an antibody is a protein which neutralizes antigens]. The average adult circulation contains 5 liters of blood (roughly 5.28 quarts). • Blood completes the entire systemic circuit – from left heart through the body to right heart – in 90 seconds. • Every cubic millimeter of blood contains 5 million RBCs. • RBCs survive about 4 months; neutrophils survive about 6 hours. range for platelets is 140-440 x 103/μL of blood. formed when sticky platelets become covered with fibrin – a plasma protein that holds the blood clot together.